I was going to write a post a few weeks ago called “I don’t run well with others,” and here’s the back story. As I mentioned a month ago, I have been dilly-dallying around with running for the last I-don’t-know-how-many years. 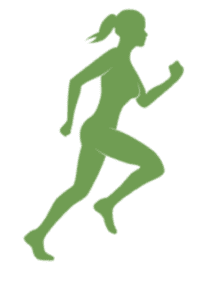 I wanted to be able to run two or more miles straight, but I kept doing a combination of walking and running when I went for my jogs. I always had some excuse on why I wasn’t running the entire route. I eventually realized that the reason was all in my own head. Once I took away all my mental excuses (I’m too old, the hills are too hard, etc), I ran my first two miles straight. I followed that with three miles a day or so later, and then I got ready to do four. Rather than run those four miles on my road with all the hills, I decided to run on the Heritage Rail Trail which is a relatively flat surface. My plan was to run to the 2 mile marker and then turn around and run back. I got to my turn-around point, feeling great, and started the return run. At the same time another runner came up behind me, turned around and asked if he could run with me. I had been inside my head as I ran the first two miles, mentally writing a post. I didn’t really want to be disturbed but also did not want to say no. So I just stated the obvious, “Well, I’m much slower than you.” He told me that was great because he wanted to force himself to run slower so he matched my pace and continued on. Except it wasn’t my pace I was running now. I was running faster than my 12 minute mile because I didn’t want to hold this dude up. So I was uncomfortable and could not get back into my head. Instead of focusing on the things I had been thinking of previously, now I was thinking about my breathing and speed and body and I was getting frustrated. So after a short time of trying to run a little slower and not being able to do it, I stopped and told him that was enough for me. So he kept going. And I missed my goal of running the four miles straight that day. And all I could think of was that I simply do not run well with others. Well, fast forward a month, and I’ve been running four miles non-stop at least three times a week, up the hills near my home. I haven’t improved at all in terms of my time, but I’ve been having a great time just finishing my route. So when asked if I wanted to do a 5K run this weekend, I was torn. There are other people at a 5K. How will I be able to focus? I can’t run with other people, can I? But 5K is only 3.1 miles, and I’m doing 4 now so physically it should be fine. What to do, what to do? I said yes, and at 9am today I was standing at the starting line of a 5K race. When the air horn sounded, off I went. As expected, I found that it was extremely distracting for me to run in a race. There are people in front of you, behind you, cars waiting for you to run by, police directing traffic, people talking to you. Oh my! But I told myself this morning I was going to finish the run no matter how distracted I got. And you know what? 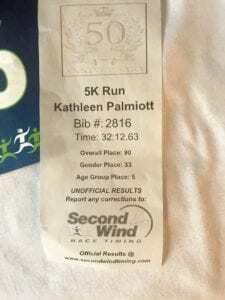 I not only finished, but I was 5th in my age group (probably out of 5!) and I improved my time from 12 minutes per mile to 10.34. So while I much prefer running alone, I have decided I actually can run well with others. And I look forward to my next 5K! Anyone want to join me?